Batiste's Dry Shampoo in Blush: Revitalises hair instantly by removing grease and adding volume. Sephora's Blotting Papers with Glacial Clay and Salicylic Acid: Absorbs oil and treats breakouts. Korres' Lip Butter in Quince: Deeply hydrates and softens lips with a hint of colour and shine. Pink perfume atomizer: So that one will always smell nice every time and everywhere. China Glaze's Nail Lacquer in Shocking Pink: Brightens up any day, even the dullest! 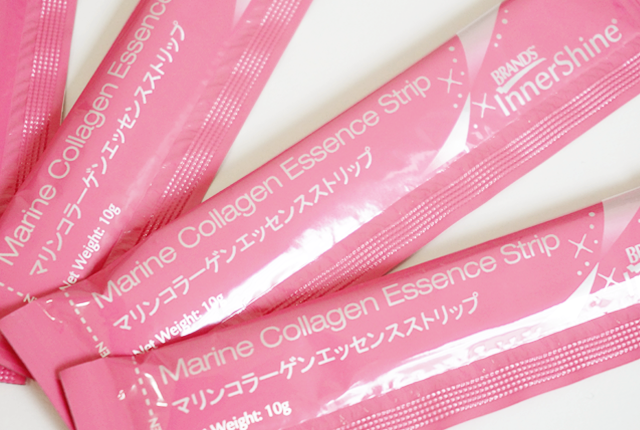 Hydrolyzed deep sea fish-derived collagen (1000mg): Collagen is responsible for the structural support and elasticity of the skin. 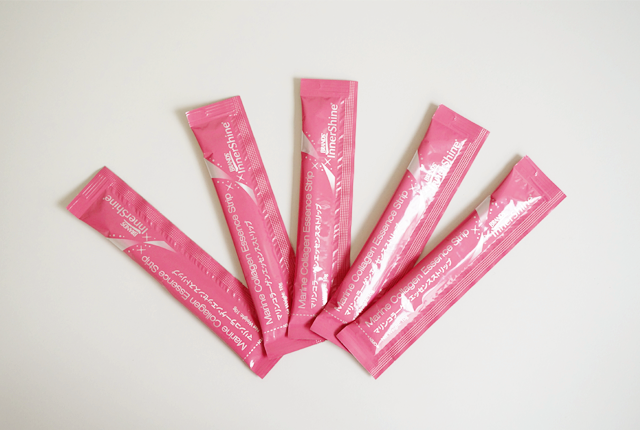 The collagen used is derived from deep sea fish, with a low molecular weight of 3,000 dalton to aid in faster absorption. Vitamin E (3IU): An indispensable antioxidant for skin health, it protects the skin from photo aging effects, the prolonged or excessive UV radiation that accelerates the formation of wrinkles and age spots. Niacinamide (A form of Vitamin B3) (4mg): It supports the health of the skin tissues by providing our cells with the energy necessary for growth and repair. This is my 2nd box and it is actually quite addictive. Once you tear open the strip, you just slurp the grape-flavoured jelly all at one go. It's really quite fun. Haha. Anyway, as I have mentioned in previous entries, the effects of such supplements aren't instant; it takes a while to show something. But I do like that this is really convenient, tasty and not too sweet, unlike some bottled ones that I have tried (They are like loaded with diabetes. And to have to drink a bottle everyday... :\).